This project may be made using either a Kumihimo disk or a marudai and tama. 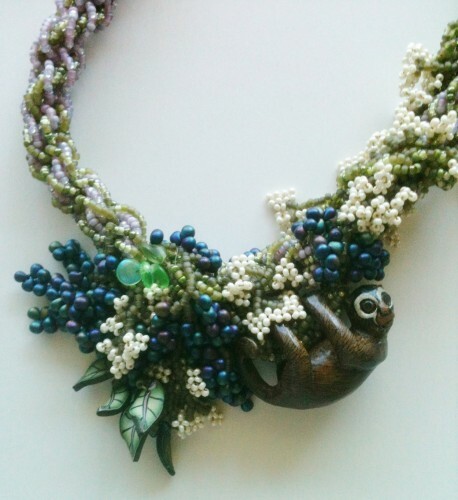 Once the necklace is made you will learn how to capture the Tagua Nut cat during the braiding process. 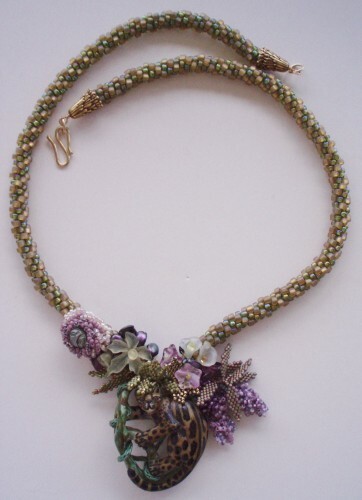 Embellishments included in this project are peyote stitch leaf groups, coraling and wild roses. This kit INCLUDES the tagua nut focal piece. The normal price for the focal is almost as much as this fabulous kit. There are lots of fun embellishments to show off the focal area. The kit has all of the required beads and then some (in case you don't know when to stop embellishing like me), the tagua nut creature, threads, pewter end caps S hook. Of course, I have included the needles and bee's wax, too. When you choose this kit I'll send you close up photos of the available tagua nuts for you to choose you own personal favorite. Additional Supplies Required: Small sharp scissors, tape measure, New super glue or Hypo glue, marudai braiding table, eight 85 gram tama (bobbins), small drawstring bag, weights for the bag equaling about 270 grams, ½ roll of quarters, utility “S” hook, chop stick. 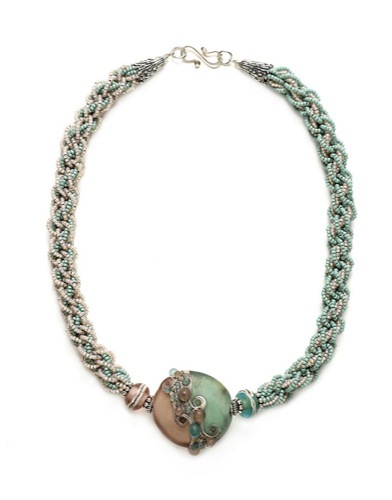 Ocean Waves is a necklace that's easy to make but hard not to love. It seems to be alive with undulating waves that are made up of beads and other precious bits all floating along with a few small surprises (four adorable little lamp work fishies) caught in the current. 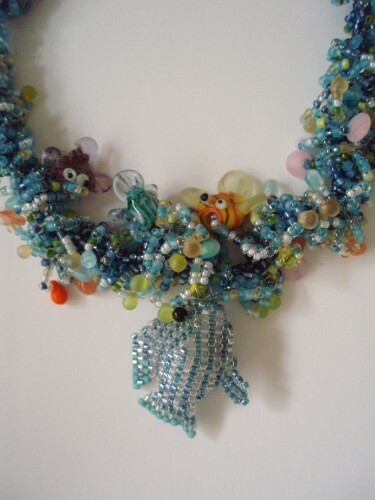 Learn progressive netting and while making this necklace you will also learn how to create the precious little fish that's happily riding the breaker as well as the foaming necklace. 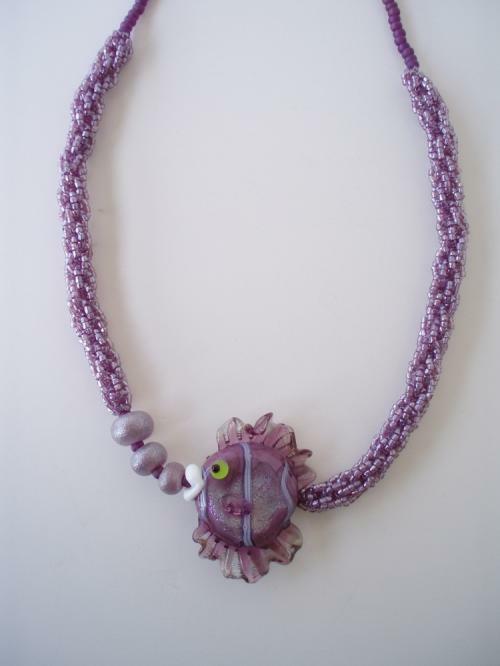 A basic knowledge of peyote stitch will be helpful while making the fish portion of the necklace. Learn how to make a gently twisting Ndebele necklace cord and a 2-drop peyote stitch while making this most charming necklace. 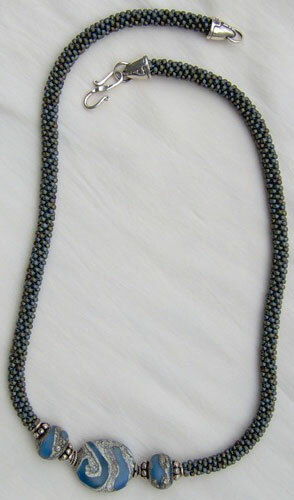 The main portion of the necklace takes on the look of Herringbone stitch (Ndebele) but is done in 2-drop peyote stitch. The kit is packed with Super Duo's and a contrasting seed bead color for a most dramatic look. This is a fabulous necklace made even better by adding the special lamp work bead set that was made especially for this necklace. Look for them on our "Bead Sets" page. NOTE: I have changed the clasp portion of this necklace to an S hook and jump rings. If you have never done beading in the past this is a fabulous project to help you get started. If you are an experienced beader you will be fascinated at how the Moon Beams come together to make a sparkly necklace in such a short time. This will also give you a taste of using Twin Beads. I’m sure this project will inspire you to put the Twins together in new ways for your future projects. Additional Supplies Required: Small sharp scissors, clear nail polish, two chain nose or flat nose pliers. Learn to make Russian Leaves the easy way. With step-by-step photos you’ll have no problem learning this method. Cascading Autumn Leaves is certain to be your favorite show stopper piece. The leaves require peyote stitch but even if you have never tried the stitch before I'm sure you will have great success with this technique. 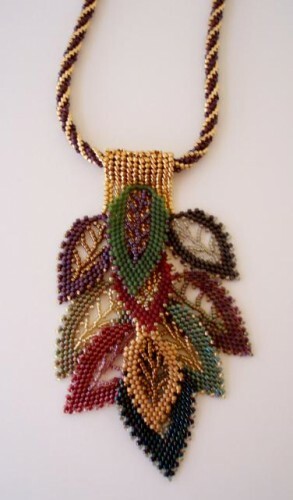 You’ll also learn how to make the tightly twisted Ndebele necklace strap upon which your Russian leaves will hang. This kit is loaded with Delica beads in the many shades of Autumn plus the size 15 beads for the leaf vains, Delica beads for the Ndebele cord, gold filled S hook and jump rings. Threads, needle and bee's wax are also included. Additional Supplies Required: Small sharp scissors, clear nail polish. The braid used to make the Rain Forest Morning is a most unique and inventive kumihimo braid. When completed, it will seem as though strands of interior beads are caged inside of an exterior braid and the color way is reversed for the second side. A second braid is added to make the twisted vine upon which the sloth lazily hangs. This kit INCLUDES the tagua nut focal piece. The normal price for the focal is almost as much as this fabulous kit. There are lots of fun embellishments to show off the focal area. The kit has all of the required beads and then some (in case you don't know when to stop embellishing like me), the tagua nut creature, threads, pewter end caps and sterling S hook. Of course, I have included the needles and bee's wax, too. When you choose this kit I'll send you close up photos of the available tagua nuts for you to choose you own personal favorite. Additional Supplies Required: Small sharp scissors, tape measure, New super glue or Hypo glue, marudai braiding table, twelve 85 gram tama (bobbins), small drawstring bag, weights for the bag equaling about 510 grams, ½ roll of quarters, utility “S” hook, chop stick. My all time favorite flowers are called Bachelor Buttons. I just knew that I would make a necklace to commemorate them eventually. I have done just that with this piece and you too can wear a gorgeous wreath of them around your neck in no time at all. You will learn only two simple knots to make the entire macramé necklace base. The flowers are super easy and quick to make. I know you will love this piece! This project looks a lot like a crocheted rope, but instead of taking days to make it will only take a few hours. It is made on a Japanese Marudai braiding table. You will learn both how to set up the Marudai and how to do the actual braiding. Making the Kumihimo necklace is so very fast that you will no doubt want to make lots of them. Learning this technique and the use of the Marudai will then allow you to continue with many more advanced projects. The video below was prepared for my class at the Bead and Button Show. I do hope you find it helpful. I love art glass! It is all so beautiful. When I buy a piece I cannot wait to make a great piece of jewelry so that I can wear it and have others admire it as well. This tribute project is made on a Japanese Marudai braiding table. The literal translation for Marudai is “round table” and that exactly what it is—a round table about three feet high with a small hole in its center. While making this project you will learn both how to set up the Marudai and how to do the actual braiding. Your efforts will result in a charming round beaded rope upon which you can show off the special fish and bubble bead set. 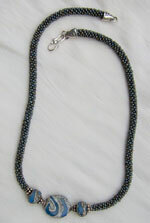 Making the Kumihimo necklace is so very fast that you will no doubt want to make lots of them. Also, learning this technique and the use of the Marudai will then allow you to continue with many more advanced projects. This thick, gently twisting Ndebele cord is a piece that, because of all its nooks and crannies, provides places for many beautiful flowers and leaves to be attached. Included in the Wild Roses kit are several leaf patterns, two flower patterns and all the materials needed to make the Wild Roses necklace. Additional Supplies Required: Small sharp scissors, bee’s wax, clear nail polish. Twist & Counter Twist is a most unique and inventive kumihimo braid. When properly completed, it will seem as though strands of interior beads are caged inside of an exterior braid. Using this ancient Japanese braiding technique, you will easily be able to complete the braided portion of your necklace in just a few hours. You will then learn how to add some Coraling and Frothy Fringing for a super fringe effect. This circle of double ribbed Ndebele rays makes a dazzling sunflower focal point that may be worn on either a necklace (as shown) or removed and worn on a bracelet. You will learn how to make a double Ndebele ruffle and to capture a dichroic cabochon using only beads. 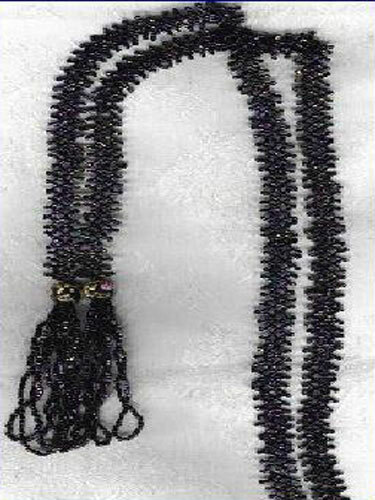 The kit includes all of the materials to make the necklace as shown. 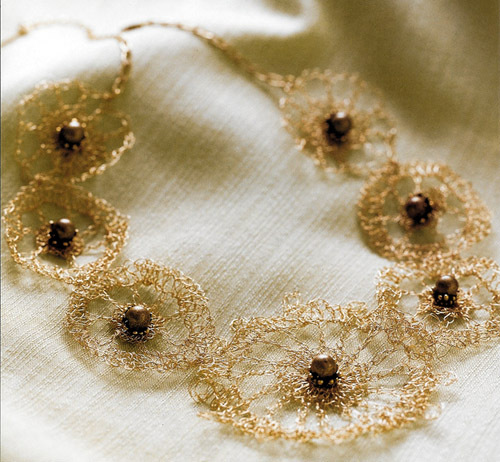 Delicate Dahlias is the most delicate piece of jewelry that you can make. It is light and lacy and can be dressed up or down. In short, it looks great with anything. Just a small amount of crochet experience is required. 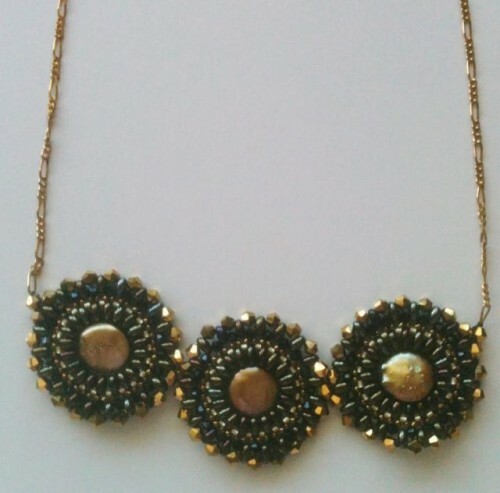 The necklace is made in small, manageable pieces and then assembled making this an easy to accomplish project. This project is made using a needle weaving technique that allows the ending on the second side to be exactly the same as the beginning. In making this piece you are encouraged to give free rein to the rain forest spirit; a place where almost anything can take root and grow. 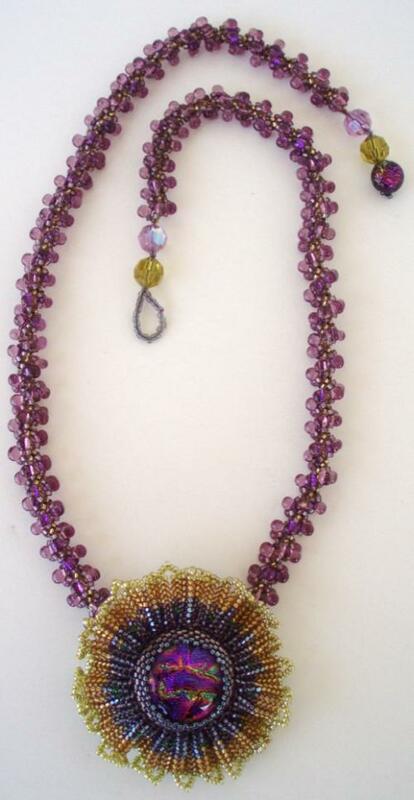 You will learn to needle weave using a rainbow of colored beads in a medley of sizes and shapes. The Tagua Nut focal bead is simply spectacular and is selected from a primordial area of South America. Each one is hand carved into a unique creation by a native artist using only traditional tools. The kit includes everything needed to duplicate the necklace as shown. 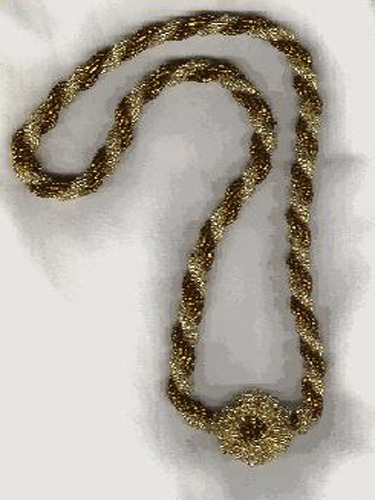 This is a most unique twisting stitch which yields an extremely stable thick rope using nothing but a beading needle, beads and thread. This project requires neither prior beading skills nor any special equipment. This project is made on a Marudai braiding table. With this kit you will learn both how to set up the Marudai and how to do the actual braiding. 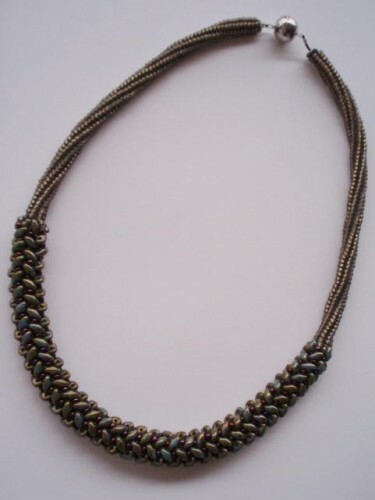 Your efforts will result in a charming vintage style rope lariet necklace. The incredible Paula Radke beads really make this project sing. Making the Kumihimo necklace is so very fast that you will no doubt want to make lots of them for yourself or for gifts. Easy matching earrings finish off this ensemble. Additional Supplies Required: Small sharp scissors, tape measure, New super glue or Hypo glue, marudai braiding table, eight 85 gram tama (bobbins), small drawstring bag, weights for the bag equaling about 340 grams, including ½ roll of quarters, utility “S” hook, chop stick. This is a very simple and easy technique. The piece in the photo is about eighty years old, but you can duplicate it almost exactly. You will have fun making this one. This project is made on a Japanese Marudai braiding table. The literal translation for Marudai is “round table” and that exactly what it is—a round table about three feet high with a small hole in its center. With this kit, you will learn both how to set up the Marudai and how to do the actual braiding. 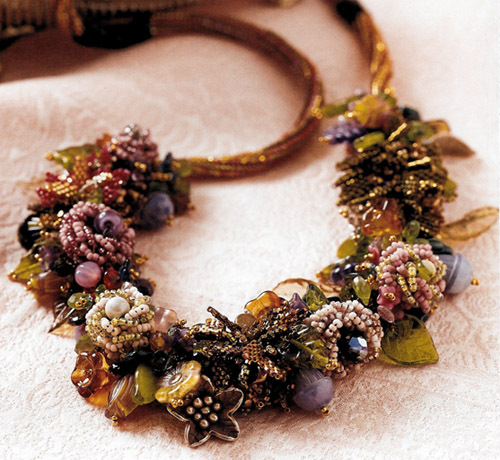 You can complete this necklace in just a few hours. 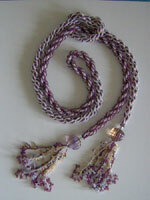 Making the Kumihimo necklace is so very fast that you will no doubt want to make lots of them. The braid used to make the Sea Foam Necklace is a most unique and inventive kumihimo braid. When completed, it will seem as though strands of interior beads are caged inside of an exterior braid. And you can see that the color way is reversed for the second side of the necklace to achieve a complete color transformation. The video below was provided for my class at the Bead and Button Show. I hope you find it helpful. Additional Supplies Required: Small sharp scissors ,tape measure, New super glue or Hypo glue, wire cutter, round nose pliers, chain nose pliers, marudai braiding table, twelve 85 gram tama (bobbins), small drawstring bag, weights for the bag equaling about 510 grams, ½ roll of quarters, utility “S” hook, chop stick. Join our mailing list and be notified of new products and other specials.